Syracuse celebrates a goal. Mandatory Photo Credit: Kicia Sears, The Juice Online. 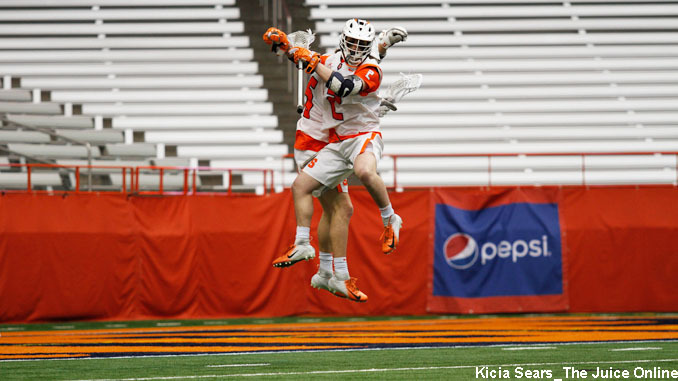 Syracuse attackman Bradley Voigt and midfielder Jacob Buttermore each scored a hat trick, and the 11th-ranked Orange scored the final 12 goals of the game to rout No. 20 Hobart 17-5 on Tuesday evening. The teams played evenly through roughly the first 20 minutes, with the Statemen’s Eric Holden tying the game at five with 7:44 to go in the half. It proved to be Hobart’s final goal of the night. Stephen Rehfuss gave the Orange the lead for good on an unassisted goal two minutes later, and David Lipka added a goal with 2:08 to go to give the Orange a 7-5 lead going into intermission. SU poured it on coming out of half, with Voigt, Buttermore, Jamie Trimboli and Nate Solomon scoring four unanswered goals in the third to put the game out of reach, with the Orange taking an 11-5 lead after the third quarter. The teams emptied their benches in the fourth quarter, and Matt Magnan scored the first two goals of his collegiate career, while Justin Kim added his first collegiate goal on a man-up situation with 5:31 to go to give SU its final goal of the evening. Eleven different players scored a goal for SU. It was equally as impressive a performance for the defense, which stymied the No. 2 scoring team in the nation. Hobart trailed only Penn State in goals per game at 16.11. The Statemen’s previous low on the season was 10 goals. SU’s second half surge was evident in the box score. After being outshot 28-20 in the first half, the Orange dominated in that category 27-13 in the second. SU also cleared 22 of 25 attempts compared to 14 of 19 for Hobart. Syracuse retained the Kraus-Simmons Trophy for the sixth straight year, while head coach John Desko celebrated his 250th career win. The Orange is next in action in its regular season home finale on Tuesday, April 9, at 6 p.m. for a matchup against Cornell. The game will be televised on ESPNU.